Just as the name suggests, Reef Run is a video pokie game that centers on a magical underwater theme. If you have already played this game, you can say that one of the most memorable aspects of the game is the catchy tune. Reef Run is set of background that appears to be an underwater city. Keep in mind that Reef Run does not have a complicated storyline. Its just a simple and easy, but immensely entertaining pokie game. The symbols that can be seen in the game are mostly sea animals, such as sea horse, sea snail, octopus, lobster, crab and puffer fish. This online pokie has been developed by Yggdrasil Gaming who now have around a dozen games in their portfolio and are directly competing with industry giants such as NetEnt and MicroGaming. All games from this company can be played at Casino Room for free or real money, together with a $600 first deposit match bonus and 100 free spins. Reef Run is a video pokie that a lot of players can easily understand. This is because the game comes with a standard setup, which includes 5 reels and 3 rows. Furthermore, it has the exact same playing panel as other Yggdrasil Gaming pokie games. One of the many reasons why Reef Run is so popular is because its high Return-To-Player rate (RTP), which is 96.4%. Further, it has an easy-to-use and intuitive interface. If you have played pokies in the past, then the game easily fits to you like an old glove. If there is one thing that sets Reef Run from other pokie games is the free spins feature. Why? Because it’s very liberal. In fact, its so liberal that your free spins can go for long stretches. The game has a free spin symbol that comes in a form of a seashell. While playing the game, you will grow to love the symbol as it can be a symbol of a possible big wins to come. In order to trigger the free spins, you will only need to have 3 seashell symbols show-up anywhere in the screen. For 3 free spins symbols, you will then get 10 free spins. However, that’s not all! If you get more free win symbols, the number of free spins you will receive will also increase. For example, if you get 4 free win symbols, then you will get 25 free spins. For 5 free symbols, you will get at least 63 free spins. As if the free spins are not fun enough, the free spin mode also triggers another feature of the game. When the free spin triggers, the “mode” of the game also changes. The background then switches to an underwater highway. When the game is in its free spin mode, the normal symbols will have an additional multiplier. The multiplier is attached to different animals. Reef Run features 5x, 10 and 20x symbols. For example, if you get a puffer fish, which has a multiplier of 20, then your last win will be multiplied by 20 times. Now for the most exciting part! What happens if you get a free spin symbol, while in the free spin mode? You get more free spins of course! On top of that, you will only need at least two free spin symbols to get another re-spin. This means that a single free spin trigger may last for very long stretches and big wins. Reef Run is not a progressive pokie game. However, it is very generous when it comes to winnings, along with its high Return-To-Player rate. The maximum win you can get from Reef Run is the 20,000x the maximum line bet. 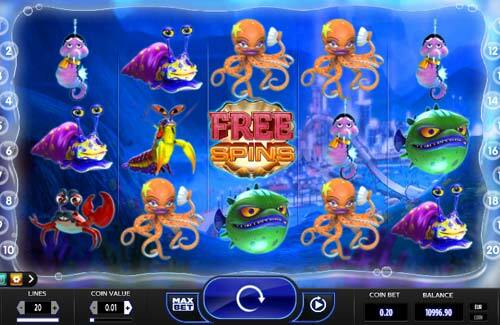 All in all, Reef Run is a breath of fresh air to the common complicated and story-themed slots. The game is simple and easy, with winnings that are big. The best thing about this pokie game is the free spins feature. A single free spin can potentially lead to a long free spins that doesn’t seem to end.